Swiss architecture is commonly co-notated with the names of celebrated architects such as Marion Botta, Peter Zumthor, or Herzog & de Meuron, and with their iconic buildings. Yet there is much more to the topic than, for example, beautiful private houses or spectacular public projects such as museums. 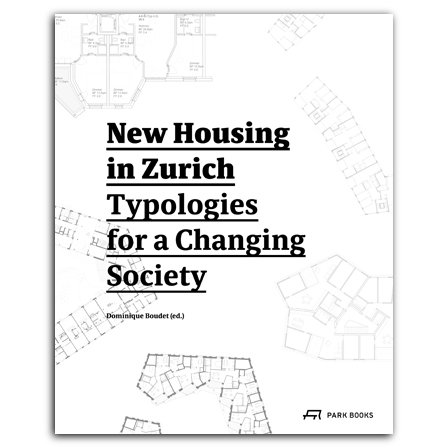 This new book looks at the Swiss variety of co-operative housing developments with a special focus on the city of Zurich. Over the past two decades, such developments have changed significantly. Support by public funding and open competitions have helped to design and realize a vast number of highly innovative co-operative projects in Zurich over that period. Many of them can serve as well as models for how to meet the constantly increasing demand for urban housing. New Housing in Zurich is the first comprehensive survey of contemporary co-operative estates in Switzerland’s largest city. It features some 50 projects by type, lavishly illustrated with images and plans, thus also providing a typology of multi-unit residential architecture. Essays on the history of co-operative housing in Switzerland, the interplay between co-operatives and the city and their impact on urban development on the larger scale, on new urban and architectural concepts, on co-operatives in the post-industrial age, and on their social dynamics round out the volume. Featured projects include work by Burkhalter Sumi Architects, EM2N, Gigon Guyer, Knapkiewicz & Fickert, Peter Märkli, Pool Architekten, Stücheli Architekten, Adrian Streich, von Ballmoos Krucker Architekten, and others. Named one of the Most Beautiful German Books 2018. Book design by Antje Kolm. lives and works as an architecture critic and publisher of AMC architecture magazine in Paris. is an architect and senior research assistant at ETH Zurich’s Institute for the History and Theory of Architecture (gta). , born 1973, took his degree in architecture from ETH Zurich. He lives and works as an architectural publicist in Zürich. He also teaches at Lucerne University of Applied Sciences and ETH Zurich. , born 1966, studied architecture in Düsseldorf and Berlin and also read history and theory of architecture at ETH Zurich. He has been an editor with Hochparterre architecture and design magazine in Zürich since 2010.